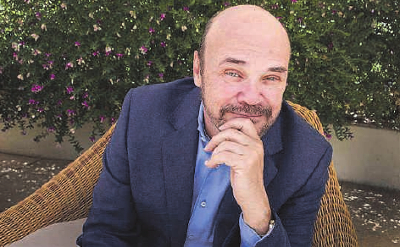 Martin Armstrong, an independent consultant who has improved the study of the economic cycles by Kondratiev, had already foretold that the birth of the euro carried in it the seed of its own destruction, because it dealt only with a monetary union without a tax union and a debt union. Or, to say it in other words, without including the public possibility of inventing and disinventing money without bringing about debt. Now he is announcing a new crisis, which may be taken advantage of to introduce the elimination of anonymous currency, but with a telematic currency network in the hands not of an independent justice, but in the hands of banks, which would bring about a real telematic tyranny, where the protesting individuals might be arbitrarily dispossessed of all their purchasing capacity. We offer two interviews which inform about the persevering work of Martin Armstrong. We take advantage of this excellent job to vindicate a General System to introduce an economy in the service of people and of the peoples, removed both from the telematic tyranny and from the corrupt and irresponsible (anti)system which has been going on for 4300 years. The Joan Bardina Study Centre Team. La Vanguardia. Thursday, 25th June 2015. La Contra. 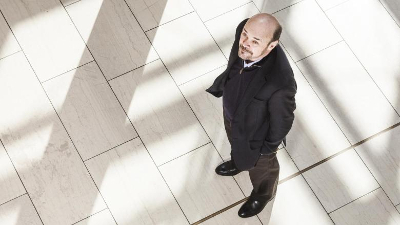 Martin Armstrong, an independent financial advisor. Between whiskies he tells me his story, which I had known in the wonderful documentary The Forecaster, by Marcus Vetter, which was presented at DocsBarcelona, and which explains conscientiously facts and evidences of how his model of economic forecast drove him to advise international governments and investors, and also how the most powerful New York bankers tried to ruin him, accusing him of having swindled three billion dollars, and how the CIA tried to get hold of his system to stop him from giving away to the public the pyramidal system on which the world debt has been based during decades. Years ago Armstrong had forecast that on October 1st, 2015, there would be a debt crisis which will shake the world economy. Martin Armstrong. Photograph: Inma Sainz de Baranda. -At age 15 you were already a millionaire. -I made money by buying and selling old coins. At 23 I already published forecasts on the gold market, counselling investors and even Swiss banks. -You developed an economic model which demonstrates mathematically the existence of cycles in economy. -I was very much interested to understand reason of the cycles of ups and downs in the markets. I studied computer engineering and artificial intelligence and in 1972 I created a programme which connected different fields, economic data, with my great passion, history. The programme used a great data basis to find a pattern to explain these fluctuations of the world economy. -I observed that, from 1683 to 1907, the financial panicking happened on average every 3,141 days (8.6 years), the Pi number multiplied by one thousand. And so came up my code, which not only predicts the fall of the economies, it also foretells wars and political changes. -You became the most sought after world advisor. -In 1983 I founded the Princeton Economics Group, and kept growing, with branches in all the world markets. Many governments requested my services, but they did not necessarily do what I recommended. -You foretold the crash of 1987, the Nikkei breakdown (1989) and the financial breakdown of Russia (1998) thirty days before it happened. -It is all interconnected: if for example somebody decides to invade a country, before that great money movements take place. When the London Financial Times published on the front page my prediction of the financial fall of Russia, the CIA wanted to buy my programme, but I refused to sell because they did not want it to help people, but to take control. -I don’t think they gave up easily. -I am a good programmer, all my computers were connected among them: if there was an interference in one of them the whole system stopped working. -You were invited to join a group of powerful bankers. -Yes, the New York Club of investors, people who were involved in risk funds. I didn’t want to join their life system. I already travelled first class, stayed at the best hotels, had a magnificent house… Beyond a given standard of living it is impossible to have a greater luxury and to spend more, then earning money becomes a game of Monopoly, you buy and sell companies. I didn’t want to go beyond this line. -Previously the bank took care of its clients, companies were created to generate jobs. Credits are for this. Nowadays they all work as transaction banks, they do not care, they let you have the money and sell your debt to a third party. -They punished your ingenuity with eleven years imprisonment. -In 1999 I warned Amada Corporation, an important Japanese client of the metal sector, that the untouchables club – Goldman Sachs and a group of investment banks – would steer the metal market prices. -Was it your computer which inferred this? -Yes, and this meant great unexpected losses for the club. The reaction was to accuse me of fraud and together with two employees of the Republic Bank of New York I was sued for conspiring. -I used to record all the conversations to show that my work was legal, but the lady judge did not admit these recordings as evidence of my innocence. Incredibly, she appointed a high executive from Goldman Sachs to manage my company. In 2001 the Republic Bank of New York (then HSBC) was declared guilty of fraud and compelled to pay back damages after demonstrating that there was no fraud. -And why didn’t they set you free? -HSBC, a member of the club, didn’t want me to talk. Besides, the CIA wanted my powerful programme and I refused to deliver it. After the first seven years they imprisoned me five more years for contempt of the court. -How did it all end? -I was lucky. My case arrived at the High Court and they set me free (2011). The banks had to pay 5,700 million dollars in fines for criminal acts, those which I had started exposing in 1999. -What did you learn in prison? -I learnt not to give up, and I do not regret it. Now I wanted to retire, but my clients have come back because they know that I do not make part of politics nor of bankers. In September I shall put my programme in the internet so that it will be available to everybody freely, and I hope it will help to bring about political changes. -Which is your today’s forecast? -In October this year will start a crisis of the governments which will reach its highest point in 2017, and they will feel compelled to become more aggressive with the people in order to keep their power, with more taxes and suppressing as much as possible the right to vote. -That citizens become conscious of how their rights are being curtailed, they are already preparing to eliminate currency so that we function electronically through the banks, and in this way we have no manoeuvring capacity. Die Welt. Thursday, May 7, 2015. There will be a great crash. 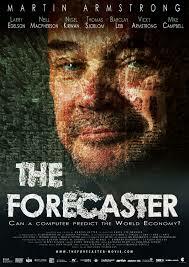 Martin Armstrong predicted the crisis, as he was acting as a seer and a star of the financial markets. Later he was thrown into jail without a trial. Now he is working out his figures and foretells the next crash with the exact date. By Nando Sommerfeldt, Holger Zschäpitz. Analyst Martin Armstrong ventures exact declarations on the drop of the Stock Exchange based on data processing models. Photograph: Steffen Roth. The fall of Rome cost Martin Armstrong about 100 million dollars. All this money has gone through his hands during a period of about 30 years, to fix the causes of the economic fall of the Roman Empire. What he wanted to find out was at which speed the end had actually come. To find out he had to track and buy all the available coins. He thought he could establish the speed of the fall of Rome by finding out the decrease of the gold contents in coins. Armstrong is a man who wants to know things accurately, and to this end he spares neither effort nor expense. He has developed the «Pi Code», which many experts still consider some sort of world formula. He reveals how the world economy works and shows the eternal alternation of the economies. Actually Armstrong has already predicted crises exactly to the day. For example he foretold the “Black Monday” which happened in Autumn 1987, the first crash of the stock exchange after World War II. 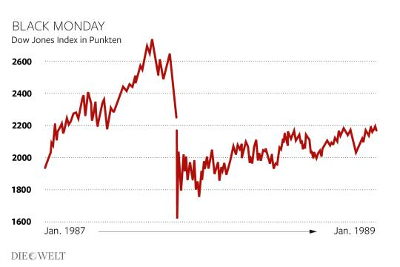 At the time, the Dow-Jones index suffered a loss of 22 per cent, the highest loss in one only day in its whole history. 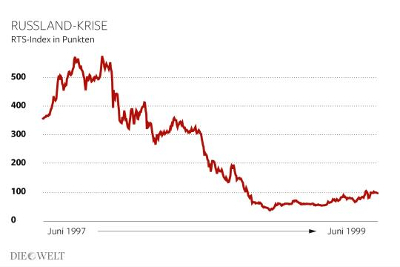 Armstrong also announced very precisely the drop of the Nikkei index in 1989, and the Russian crisis in 1998. In a more recent past he has also been exceptionally right. Already in 2012 he foretold that the national Swiss bank would not be able to fit the franc with the euro for much longer, and therefore to face the capital market. His prediction came true at the beginning of this year. Black Monday. Dow-Jones index in points. January 1987 -> January 1989. Photo: Infografik Die Welt. The first crash of the stock exchange after World War II was the Black Monday, in which the Dow-Jones lost in one day a quarter of its value. In the history of finances this day has become known as Black Monday. Highest point of Nikkei. Index in points. January 1989 -> January 1991. Photo: Infografik Die Welt. 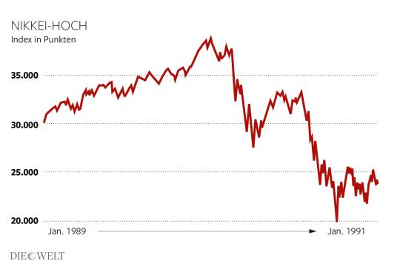 After the peak in 1990 up to now the Nikkei has never recovered. Russian Crisis. Index RTS in points. June 1997 -> June 1999. Photo: Infografik Die Welt. The Russian indicator index RTS (Russian Trading System) fell heavily in the second half of the nineties. Perhaps this happened also with the collection of Roman coins. It belonged to one of the data banks of full world economic data. Together with an army of assistants Armstrong put together information of the last 6.000 years. His world formula, with which he made millions, aroused greed and caused one of the most mysterious financial scandals in the history of economy. In an absolutely surprising way he was accused of defrauding his clients of hundreds millions dollars by means of a snowball system. He lost twelve years of his life behind bars without having ever been sentenced. Stories differ on the circumstances of his imprisonment. In fact the American Stock Exchange authority SEC mentions an admission of guilt by Armstrong, a confession he would have done seven years after the facts took place. Armstrong himself considers he is an innocent who has had to spend twelve years in prison without convincing evidence nor a sentence. His story with the world formula and his mysterious imprisonment are so remarkable, that the German documentary director Marcus Vetter made a film with his story. «The forecaster» is a film which will be shown in the German cinemas on 7th May. This 66 year old man starts by having a glance at his life, his formula, and his enemies. And he gives the date for the next crash. Die Welt: Successful investors, such as Warren Buffet, George Soros, or even Gill Gross are legends. However, only bad boys such as Nick Leeson, Jordan Belfort or of course Gordon Gekko, have become film stars. Now it is you and your story which disembark at the cinema. Are you also a bad boy? Martin Armstrong: No. On the other hand we never had problems with Nick. He has always paid. But I could tell you some stories about him and his cheerful relationship with the banks. Bankers need these isolated «naughties» and some time ago I asked if it was at all possible not to know where a billion dollars had disappeared. Die Welt: What did they say? Armstrong: They laughed boisterously. But my question was earnest. Finally, bankers like Goldman Sachs say again and again: «We have lost eight billion dollars. We have no idea where this money is.» This is nonsense. The truth is that finally there has been no bank raid. Die Welt: But you were treated like a bank raider, and spent twelve years in prison. Armstrong: Yes, I found myself in prison. No sentence was ever passed on me. The court maintained that I had done something illegal, and I said no. Die Welt: You were never sentenced, but nonetheless you were not set free for years. How could that happen? Armstrong: I would call it a Mexican draw. There was a conflict in which none of the two parts could win. The government wanted my information, and I refused to give it. Therefore they simply held me in jail, on no other reason. Die Welt: You were accused of having swindled more than 700 million euros on your clients by the snowball system. Armstrong: Yes but that’s a lie. My bank –as many banks do – overnight got hold of my money, and the following morning they did not put it back in our accounts. It had disappeared. We never enacted any snowball system. The bank swindled us out of our money. They took our money. Die Welt: What happened then? Armstrong: We wanted to lodge a complaint and announced urgent proceedings, but the government opposed our plan. So it protected the bank and accused me. Die Welt: Isn’t it a paradox that not one banker has been jailed for the moves of the financial crisis, while you have spent twelve years behind bars? Armstrong: It is not a paradox. It is logical. After all banks work side by side with governments. They have the task to place the state debt. This is the main problem. They swell the world day after day. The close relationship between politics and banks is the main problem in our economy. They support each other. Die Welt: Bear Stearns and Lehman were put to the sword. Armstrong: It is true. In Washington they did not forget that Bear Stearns in 1998 refused to take part in the rescue of the LTCM hedge funds. And Lehman was one of the main competitors of Goldman Sachs, which were close to the government. The finance minister Hank Paulson got rid of a competitor for his old company. Die Welt: Conspiracy theoreticians couldn’t say it better. Armstrong: It is the truth. The close relationship between politics and the bankers’ club is the reason why I have given my consent to the film. Die Welt: The Wall Street Journal in the eighties wrote that people who think that talking is cheap, had never spoken with Martin Armstrong. At the time you charged 30 dollars per minute as a consultant’s fee. How much do you charge today? Armstrong: Business is fine. I can only say so much. Die Welt: Supposedly you have found the world formula and are again a sought after man, who advises against the great crash of the debt. Have you also got a solution for this problem? Armstrong: We must transform this debt into productive capital. In the case of companies excessively indebted, such debts must be changed for a participation in the companies. The creditors of an insolvent company become its unexpected owners. For this reason they must be responsible of the debts towards the state. Die Welt: Into which title deeds would you change the state debts? And in that case, do the federal debt holders obtain participations in the federal chancellory or in other state properties such as public companies? Armstrong: In my model creditors do not get any fixed payment of interests from the German state. Rather the money flows in productive investments, in companies which create jobs. Die Welt: It sound as great state capitalism, where bureaucrats invest money in any enterprise. Armstrong: No way! The coupons which German creditors receive for their loans to the state may be changed into participations in companies of their choice. In this way there is much available capital with which to support private entrepreneurs and to bolster growth. Die Welt: Or a system of people’s property backed up by the state. Armstrong: I don’t like any system of state entrepreneurship. They must be exclusively private companies. States do not create anything, they do not produce anything. Public management is not able to carry out any clever action, not even organizing an automatic slot machine for chewing gum. Die Welt: I beg your pardon? Armstrong: States are not even able to pay their debts. Die Welt: Why should they pay their debts, since they, on the contrary of what happens with economic subjects, live eternally? Armstrong: Because this system simply does not work. As I said, administrations do not produce anything at all, they are not in a position to manage things efficiently. As a choice, administrations keep increasing taxes, in order to face their always growing debts. Die Welt: Which political change do you recommend? Armstrong: Politics do not learn from their errors. Already Marx and Keynes used to say that administrations must face and lubricate the facts of economic life. But it doesn’t work. The cycle always wins. It belongs to human nature. This I have found out in my historical research. Die Welt: But if all the actors know the world formula and act against the cycle, then the formula loses its value. Armstrong: The cycle will never die. Even when you tell a child not to touch fire, he wants to make the experience by himself. This is what happens with adult economic actors. Die Welt: How should we invest our money in the present situation? Armstrong: The best thing is to follow the cycle, instead of fighting against it. To be there always when it goes up, and when it reaches its highest to pull back. Die Welt: This is easier said than done. Specifically, what should we do? Armstrong: At present in any case to keep away from the state debt, it is dramatically overestimated. Here will the crash come. My model announces the crash for October 1st. Die Welt: But shares are still in good health, mainly the Dax. Armstrong: Many investors are still speculating on the collapse of the euro. They buy German shares or federal debt because they know that these investments in case of doubt are valued in the strong German mark and not in weak currencies. And the probability of a collapse of the euro is very high. Die Welt: Can you give a more exact estimate? Armstrong: I should say that the risk of crash if of 90%. The whole scheme was ill-designed. In order for the euro to have an opportunity in face of the dollar, they should have worked from the beginning on a unified debt market. The great investment companies want to invest their hundred billions in state debt in unified euros and not in federal debt or in Italian bonds. Die Welt: Do you foster a unified debt? Armstrong: They could take the USA as a model. There Alexander Hamilton from the beginning put together the state debts of the federal states in one only loan: later the states started depending on themselves. They had to take control of their debts and be answerable for them. If only California goes bankrupt, neither the dollar nor the USA bank system gets ruined. It is the American system which we have suggested to the European commission, when they asked our advice for the introduction of the euro. The unified debt is the backbone necessary to establish the basis of a euro project as a currency system of the community. Die Welt: What did they answer? Armstrong: They told us that it was not politically workable, that they must first start with the euro and later regulate the matter of debt. Therefore even the Bundesbank was against the euro and kept giving us reliable information. Die Welt: The Bundesbank saw the mistake in the birth of the euro? Armstrong: In any case it was a mistake not to endow the euro with the common loans. For this reason now the European bank system is so unstable. Institutions cannot buy sure and uniform paper, they have bought Greek, Italian or Spanish paper, and when one state has had problems the banks have also reeled. If they had established joint reserves with unified loans, the euro zone would be today in a much better situation. Now we have this terrible network of state problems and bank failures. Die Welt: The Bundesbank president, Jens Weidmann, states today the need to break the devilish circle between states and banks. Armstrong: It is too late. The whole system will finally collapse sooner or later. Die Welt: When will this collapse take place? Armstrong: The euro zone economy still suffers a recession in spite of all the calculations, and also the USA. We face just a small recovery after the financial crisis of 2008. Many offices are still empty. The recovery of the share markets scarcely conceals the true situation of economy. All want to ensure their money. Die Welt: And now, what? Armstrong: There is no place left where money can be put to good safety. Perhaps in the USA, after the bubble of the state debt bursts, there will be again the possibility of growth, after the share situation has been restudied. But even then, at any time the end will come. Die Welt: What does your model say? Armstrong: The great crash will arrive in 2017 or 2018.